There are about 11 thousand troops on the island now—down from more than 15 thousand shortly after the hurricane. Over the next few weeks, the number will drop by about half as federal troops hand over responsibilities to National Guardsmen. Lt. Gen. Jeffrey Buchanan, the Pentagon’s liaison to the Federal Emergency Management Agency (FEMA), announced on Friday that troops would begin winding down operations… He is set to leave the island next week. So let’s look at those “some areas” that still need help. (Here’s a vivid and excellent description of a typical day in the life of a USGS hydrologic technician. “Every aspect of living and working there has been thrown into turmoil.”) First, the roads. Buchanan said the initial response involved search and rescue operations, opening ports around Puerto Rico and clearing roads. Until the roads were cleared, helicopters were required to transport supplies. He said all roads have now been cleared, so FEMA and local officials are able to deliver supplies much more easily without the assistance of the military. The hole is only one of 3,500 reported incidents of hurricane damage to Puerto Rico-owned roadways, with repair costs estimated at $250 million. Cars backed up for miles along Puerto Rico Highway 2 on either side of the colossal construction site, which swallowed four of five lanes. The 20-foot crater was among thousands of sites damaged by a storm that exposed an already fragile infrastructure in Puerto Rico, decimating water, power and roadways all at once. The U.S. Energy Department, which has been issuing regular reports on the efforts to restore power in Puerto Rico, just stopped releasing estimates on the number of customers who’ve gone without electricity since Hurricane Maria devastated the island more than a month ago. In explaining the change to its biweekly report Thursday, the agency said Puerto Rico’s utility hasn’t been able to give estimates on actual customers without power. It is instead estimating the amount of electricity restored as a percent of the island’s peak load. That figure isn’t ‘a direct proxy for the number of customers restored’ because many of the critical facilities that were initially restored such as hospitals ‘draw a higher load than residential customers,’ the department went on to say. In other words, the percentage of load restored could be higher than the number of homes that actually have their lights back on. The island’s leadership is touting restoration figures [see the dashboard –lambert] that show nearly 40% of electricity generation has resumed — but it doesn’t say how much of that power is actually reaching homes, schools and hospitals. 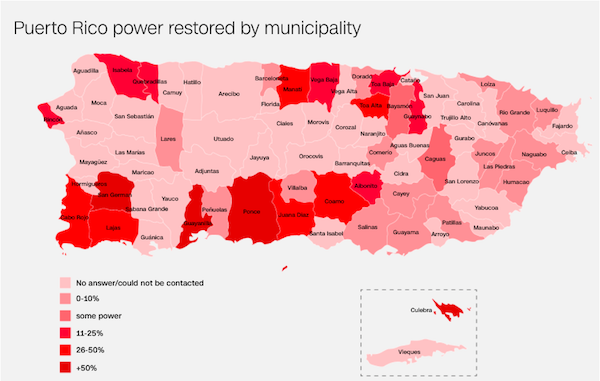 With no reliable government information, CNN tried to contact each of the 78 municipalities in Puerto Rico, which are coordinating their own recoveries. Most calls simply did not go through. Along with so much here, communication is intermittent at best. Some 42 of the municipalities could not be contacted…. 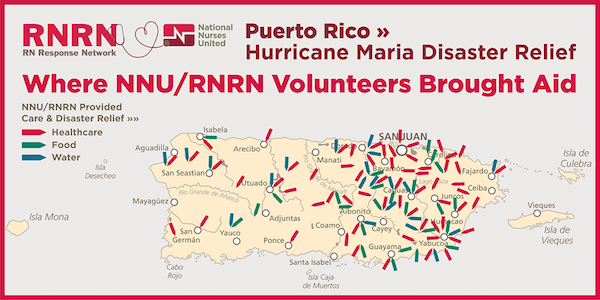 Just four regions reported that they were more than half back on line — Ponce and Guayanilla with 60% of residents with power. “We have to get away from the idea that somebody is in power, and in control, and realize that you’ve got four separate entities that have to work together and not in an adversarial way,” Bishop said, naming the Federal Emergency Management Agency (FEMA), the Army Corps of Engineers, the government of Puerto Rico and the Financial Oversight and Management Board for Puerto Rico, established by Congress to watch over the commonwealth’s bankruptcy. Let me know how that works out, Rob (and more on the FOMB below). Gov. Ricardo Rosselló’s office said 82% of the island’s water meters are now active, but many residents say they still have no running water or the water they have is unsafe. “We’re worried that in places even that have running water whether that water is safe,” said Erik Olson, health program director at the Natural Resources Defense Council. His group reported in May that Puerto Rico’s water system had the worst record under the Safe Water Act, with 70% of the people living with water that violated standards set by the U.S. law. And now the situation is worse, Olson said. Even those with tap water have been advised to boil it or use purification tablets. With electricity still unreliable in the places where it has been restored and generators prone to breakdowns, water treatment plants can go down without warning. “While boiling is an easy way to decontaminate water, most people I spoke to either didn’t (have) electricity or cooking gas to get that done,” he said. Medical workers who volunteered across the island report similar patterns of symptoms almost everywhere. In the meantime, finding bottled water can be a challenge even in San Juan. Prices have also increased since the hurricane, making it hard for low-income families to pay for filtered water. With roads still out, power unreliable, and no water, it’s no wonder people are leaving. FEMA is working on arrangements to help transport survivors of Hurricane Maria from storm-ravaged Puerto Rico to the U.S. mainland. The operation, which officials call an “air bridge,” could take some time to set up because FEMA hasn’t flown such a large number of people out of a disaster zone before.”We have about 4,000, 5,000 people coming from Puerto Rico to Florida a day,” said Gov. Rick Scott (R-FL). …has some officials anticipating a political shakeup in a battleground state dominated by the Republican party. Experts at the Center for Puerto Rican Studies at Hunter College in New York estimate that more than 300,000 Puerto Ricans could leave the island in the next two years, and Florida would likely attract many of those. “A very big deal.” It’s as if Irish immigrants who dominated the Tammany Hall machine had expressed ecstasy over the Irish potato famine, because of all the voters it brought them. At this point, we would do well to remember — as I’m sure many Puerto Ricans do — that the only plan the Democrats have passed for Puerto Rico is PROMESA, where they acted on behalf of the bondholders. A comprehensive plan for Puerto Rican recovery, including debt relief? Lol no. Puerto Rico needs $13 billion to $21 billion over the next two years to meet payroll and keep the government running, Natalie Jaresko, the executive director of the island’s federal oversight board, said Tuesday during a Congressional hearing about Puerto Rico’s recovery after Hurricane Maria. During last Tuesday’s hearing, Jaresko also emphasized the importance of clarifying what role the board will play in the oversight and management of federal funds that reach the island for the recovery and reconstruction of infrastructure after Hurricane María. The executive director said Puerto Rico will need $13 billion to $21 billion in additional liquidity until the summer of 2019. Given this scenario, the board has already proposed “legislative language” that would grant it the power to control any disbursement of federal funds made available for the government’s liquidity. The board assured that would be the way to guarantee that federal funds are used for María-related matters. In a congressional oversight hearing Tuesday, the executive director of the fiscal board, Natalie Jaresko, told the U.S. House Natural Resources Committee that her panel would welcome any legislative action that reaffirms and clarifies its powers under the Promesa federal law. She added that it would help avoid costly litigation against the Government of Puerto Rico whenever there are differences of opinion and interpretation about what the board can or cannot do. The federal board overseeing Puerto Rico’s finances on Tuesday asked the bankrupt U.S. territory to submit a new fiscal turnaround plan by Dec. 22, taking into account damage caused by Hurricane Maria. Speaking at the board’s public meeting in San Juan, Executive Director Natalie Jaresko said the board would approve or reject the revised draft by Jan. 12. The meeting, the first since Maria made landfall on Sept. 20, is a shift back to focusing on Puerto Rico’s troubled finances, which have taken a back seat in recent weeks as the island has tried to recover from the hurricane. The new plan must be for five years instead of 10, and like the original blueprint it should focus on promoting new investment, including through pension reform and corporate tax reform, Jaresko said. She added that Puerto Rico should submit audited financial statements for fiscal year 2015 by Dec. 31. Piece of cake. I mean, as long as there’s water and power in the ministries. And I’m sure that readers can imagine what “promoting new investment, including through pension reform and corporate tax reform” means, in practice. I suppose it’s a good sign that Puerto Rico has recovered enough for the powers-that-be to start arguing over what’s really important to them: How much money there will be and who gets their cut. So, optimism! I’m not going into detail on the clownish crudity of the Whitefish contract debacle, because, given Puerto Rico’s colonial status, I’m sure there are compradors involved, with their own motives, as well as administration officials and donors, and that’s more than I have time to untangle. Universal concrete material benefits, especially for the working class…. Via People: “Lin-Manuel Miranda Will Bring Broadway Hit Hamilton to Puerto Rico and Play Title Character.” Darkly ironic, given that Hamilton is an ode to finance capital, i.e., to those bondholders. This entry was posted in Environment, Guest Post, Politics on November 12, 2017 by Lambert Strether. I was wondering which kind of power was being referenced in the headline to this post. I see from the content that it’s a “tarp word:” covers all the various definitions. thank you Lambert. I guess the underwhelming response from media and public in general reflects the disconnectedness of the rest of the USA from the tiny republic of debtors. Truly a mess and one likely to be repeated. Here in Cairns, all new buildings have to be cyclone rated as we are in the zone. Building strength into structures costs money and whatever gets rebuilt in PR is likely to fail next time a hurricane hits. I don’t get the feeling that money is going to be handed out to PR, more likely they will load the poor country up with more debt. How come PR has never been able to stand up? Not enough friends in the world? PR has been an exploited colony since it was conquered by the Spanish Empire with the Americans taking it from Spain after the Spanish-American War; the new Empire has treated them even worse than the Old Empire. It’s like with plenty of other countries like Haiti, El Salvador, México, and the Congo that are a mess. Much of it is their own fault, but we keep emptying cans of gasoline and lighting matches on them because incinerating the mess, and the people living in it, is profitable. thank you J Bird. I guess we’ve seen what the other colonists did in the Caribbean, not much better, but literally starving the people by loading them up with a debt they can never pay is genocide. And the US knows the entire playbook in it. Is there an accurate account of how many people have died as a result of post-medical complications or illnesses related to the hurricane? I haven’t seen a single source and National Vital Statistics System (NVSS) lags well behind. A friend of mine was sent down to USVI by the Corps for quite a while(at least a good month) starting just after the hurricane hit. Out of curiosity I went looking for news about USVI and hurricane damage and found very little(literally almost none, tbh) in the press compared to PR. I followed the Corps on faceborg and they were posting daily updates, videos, and photos about USVI and PR, along with updates on % power back to hospitals, schools open, blue roofs installed, tons of debris cleared, water facilities, etc, for each. It is no small feat. USVI seemed to recover faster but it’s a lot smaller than PR and I don’t know if perhaps they got less of the storm than PR, or if their infrastructure was in better condition to start with due to it being such a big tourism destination. It was helpful to follow the Corps on fb but always in the back of my mind was that it’s a military entity and there is public relations involved. News of St. John has a lot of “on the ground” information. They do a lot of posts on Facebook or their site is newsofstjohn.com. Apparently they will be featured on Good Morning America tomorrow (Monday). Here’s one. I’ve found a few more, too, if you plug it into a search engine of your choice. For USVI news I use the St Croix source website, it provides updates that the power company in tine USVI puts out on the restoration there (there is also a St Thomas sourceas well). It should be noted that as far as water the USVI does things differently. Unless you are in town you are required to have rainwater catchment facilities and a cistern. If you have such then water becomes a non problem since it rains so much there. On St Croix they had to also rebuild the electric distribution network from scratch but are making progress. Also they have the power cable from St Thomas to St John back up so the main settlement on St John now has power and they are fanning out from there to restore power. Thanks. I visited there in 1987 and once the shock of a Mexican-American being there, I found an articulate, well versed and welcoming community. By January 23, 2017 this had increased to 2 billion which was very high considering the moderate population. That translated to a per capita debt of $19,000, which was worse than the per capita debt in Puerto Rico which was undergoing a severe financial crisis at the time. Hopefully, they’ll keep Jaresko far, far away. If only there was some way to get rid of most of the people on this island, it could be turned into a paradise for the rich and entitled. Think of all the construction jobs to be had for a whole series of pleasure palaces. The place could even become the new Cayman Islands of the financial world so, win-win? Actually about 80 miles east of Pr is another offshore banking/home for the rich the British Virgin Islands (recall Richard Branson has an Island there). Then as you go down the windwards you find a few other offshore financial centers as well. Thank you Lambert! This is what a well-sourced news article looks like! I was especially surprised to see Natalie Jaresko’s name appear: NC has published John Helmer’s nice work in the past, and a search on Natalie on Helmer’s site reminds us of the many times and places that sketchy characters and institutions in the dark doorways of Modern American History and Nation-Building always seem to show up in Disaster Capitalism locales. FOMB’s Executive Director Natalie Jaresko earnings: “It has been reported in the media that Jaresko will make $625,000 a year, and her traveling, moving and security costs will be covered as part of her work.” (Wikipedia). Not bad for the money. And here’s more: “she argued that the economy had to be depoliticized and Ukraine needed a technocratic government, and that she was willing to lead such a technocratic government…[but] was rejected as a prime ministerial candidate by the governing coalition.” I guess she wanted to be the sheriff in Ukraine. Now the citizens of Puerto Rico have her. Not sure about Puerto Rico, but many municipalities in the USA use Chloramine (Chlorine and Ammonia) for treatment, adding yet another layer of problems. It was one of the factors in Flint that caused the leaching of chemicals from the old pipes. It is used because it does not evaporate as quickly as straight Chlorine (lasts for weeks instead of hours). That same behaviour lends to being more corrosive. Hopefully, Puerto Rico will be able to end up with a better water supply, but I guess that depends on someone being able to increase profits. Here in New Orleans, we use the Mississippi River for water, after everyone upstream uses it for everything else… We also use Chloramine, so we use Carbon Block filters for bathing and RO for drinking. If I fill a bucket with straight water, it smells like a swimming pool! Here in California we keep waiting for the Big One to hit. In past, I have been nonchalant about. There’s always something that can kill you hurricanes, blizzards, floods, earthquakes and you just have to take your chances. However, in the past we could count on FEMA and the federal leadership in directing everyone else’s aid too. None of this is unforeseen and I am sure that the State of California is prepared, but I assume much like Texas, Louisiana, or Puerto Rico, the government is counting and needs effective Federal assistance. I am increasingly filled with foreboding. Jesus, this would almost be melodramatic, but it’s real. i dont know how much fault lies there, we start the dumpster fires and the people deal as best they can. i dont know how those countries would have turned out sans the u.s. these parasitic swine are absolutely toxic, and klein was right about their coming for us. capitalism eats itself, but it saves its home for last. puerto rico, flint, coming soon. They make a desert and call it redevelopment. Disaster Capitalists as today’s Roman army, its legions the hordes of public-private partnerships that will inundate and bury the old Puerto Rico. Not to worry. It will rise Phoenix-like as country clubs, private beaches, sea view McMansions, manicured corporate offices and private hospitals. A few straggling independent contractors, still speaking Spanish, will vie for work tending lawns, restaurants, trash yards and babies. Their brethren will be washed into the sea, to join the thousands of hectares of plastic. I can’t wait to see what lessons Wall Street and DC lobbyists have learned from redeveloping the Big Easy. If we could wait but an eternity to find out, we would all be happier. The Democrats not currently under contract to Goldman Sachs have yet another opportunity to stand and be counted, to tell Puerto Ricans that they stand for something better, something human, and to fight this economic genocide, enabled by their friends across the aisle. I hate to break it to you but Goldman Sachs and JP Morgan Chase have owed the Democrats since Bill Clinton was president. Don’t count on them to save anyone but themselves. Robbers of the world, having by their universal plunder exhausted the land, they rifle the deep. If the enemy be rich, they are rapacious; if he be poor, they lust for dominion; neither the east nor the west has been able to satisfy them. Alone among men they covet with equal eagerness poverty and riches. To robbery, slaughter, plunder, they give the lying name of empire; they make a solitude and call it peace.